The NamibRand Nature Reserve is an area of timeless desert with photogenic dunes and mountains and superbly clear night skies. You need stir no further than your chalet to appreciate this beauty - simply roll up the canvas sides to reveal the views, and then roll them down again when you crave some privacy. Each chalet has an en-suite bathroom with twin hand basins, a shower and flush toilet, and a private veranda with ample seating. The main lodge is reached via a sandy path. The lounge has welcoming armchairs and sofas, perfect for snuggling into as you strike up a conversation, and there's a cosy library where you can curl up with a book. There are 2 dining rooms where meals are usually eaten as a group. These areas all lead out to viewing decks which can be used for al fresco dining, one of which has a firepit, and there is a swimming pool. The many activities provide different means of exploring the reserve: you can drive across large tracts of desert in a 4x4, accompany a guide on a nature walk, observe the scenery from horseback and take to the skies by small plane or hot air balloon for fabulous and far reaching views. A visit to the village where most of Wolwedans staff live offers an interesting insight into local life. 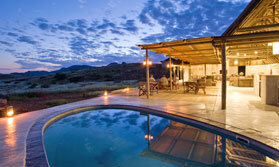 Open: Wolwedans Dunes Lodge is open all year. Location: The lodge is at the top of a dune plateau in the private NamibRand Nature Reserve in the south of Namibia. The reserve is about 400kms southwest of Windhoek. Rooms: There are 9 guest chalets set on wooden platforms, all en-suite and with private decks. The canvas walls are divided into separate sections which can be rolled up to give you a panoramic view of the desert and rolled down for privacy. Beds are equipped with mosquito nets, and there is a luggage rack for storage. The bathroom has a shower, 2 hand basins, flush toilet and selection of toiletries. The mountain view suite is set slightly apart and has small kitchen where meals can be prepared for in-suite dining. This suite also comes with a private guide, vehicle and valet. Activities: There is a huge range of activities, all of which can be combined providing you have time. These include nature drives, walking safaris, village tours, horse riding, hot air ballooning and scenic flights. Facilities: There are 2 lounges, 2 dining rooms and a library, all of which open to wide decks. There is an outdoor swimming pool set into another deck which has loungers and shaded seating areas. Massages can be arranged. There are battery charging facilities in the main lodge. Dining: Meals are usually eaten communally through private dining can be arranged. Meals are served indoors and outdoors. Dinners can be accompanied by wine from the large cellar. Children: Children aged 6 years and over are welcome. They must be supervised and well behaved in all social areas of the lodge, and must adhere to all safety regulations during game drives. Communication: There is no internet access and only sporadic mobile phone coverage.